apple is part of the Basic English 850. 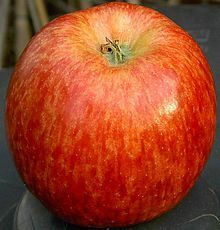 (countable) An apple is a sweet, red, yellow or green fruit. I gave my teacher an apple. (uncountable) Big Apple is a name for New York City. I went to the Big Apple. This page was last edited on 23 April 2017, at 11:25.